Hi. We're back with another Me Moment. Today we'd like to talk to you about Safco's Sol task chair. Sol supports your working environment, but also the outdoor environment by being comprised of components selected to maximize the use of recycled materials. With intelligent design, both ergonomic support and sustainability, I use this chair because it makes me feel good about causing less of an impact on the planet. The swooping back is extremely comfortable, and metal accents on this chair make it look as good as it feels. The easy-to-use central-tip mechanism provides a forward locking position, seat height adjustability, and an easy-access seat tension control provides a sit that fits your soul. Sol also offers optional height-adjustable arms for added support and comfort. Sol supports individuals in their daily work as well as the environment. Thank you for joining us for this Me Moment. Please join us again to find out how Safco can help you work hard and play harder. For a seat that supports you and the environment, check out the Sol chair from Safco! This chair is made of recycled materials and provides adjustable, ergonomic features to help make sure you're comfortable and ready for business. 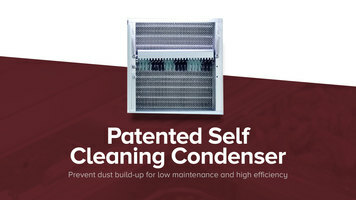 Turbo Air's self-cleaning condensers remove dust buildup daily to extend the life of your unit while increasing its efficiency for peak performance. Best of all, you won't have to pay a technician to do it anymore! Delete a category from your Convotherm with these easy steps! Always have hot and fresh coffee on hand for your customers with the Avantco CU55 coffee urn! Watch this video to learn more about this durable coffee urn and its easy to operate features.